After a four-day hunt, police in Poland's capital have finally found the man who climbed into a bear’s zoo enclosure and got into a fistfight with the beast. The 32-year-old offender was found in a hospital, where he was being treated for the consequences of his escapade. A search for him was initiated on Sunday, after he climbed into the bear enclosure for a short round with Sabina, a 200-kilogram brown bear. Witnesses, cited by the Polish tabloid Fakt, said the man, who was barefoot and wearing shorts, was the first to attack the animal. After Sabina struck back, the man decided to retreat, apparently seeing he was no match for the beast. Following the encounter, police and zoo staff found blood outside the enclosure. 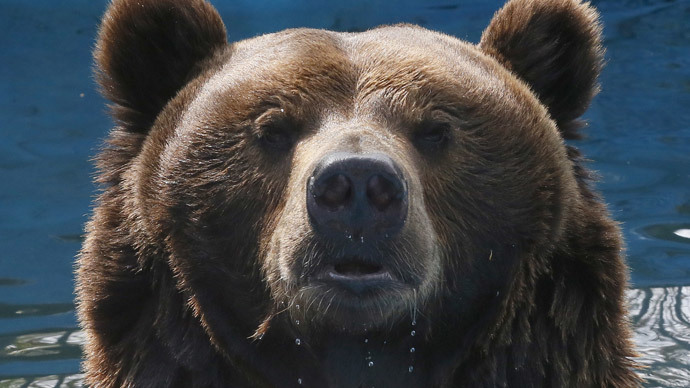 The situation “could have ended much worse” for the hapless bear-brawler, Maria Krakowiak, the head of the animals of prey section of the zoo, commented. The man himself refused to tell the police why he thought picking a fight with a bear was a good idea. He could now face a fine of up to 1,000 zlotys, or 250 euros, for provoking the animal's aggression, AP cites police spokesperson Paulina Onyszko as saying. His case is now being sent to court, Onyszko said. Maria Krakowiak said she hoped that the incident would prompt city authorities to install cameras near the bear enclosure. Although part of the zoo, the enclosure itself is situated a few hundred meters away from its territory, in a busy street. It is a popular tourist spot.